Its been a while since I have updated my blog. September and October have been so busy with gorgeous weddings every weekend so I hope to catch up with updates over the next few months. Last weekend saw me flowering 3 weddings. Emma married her other half at Norton House Hotel and I loved her choice of colour and relaxed style. 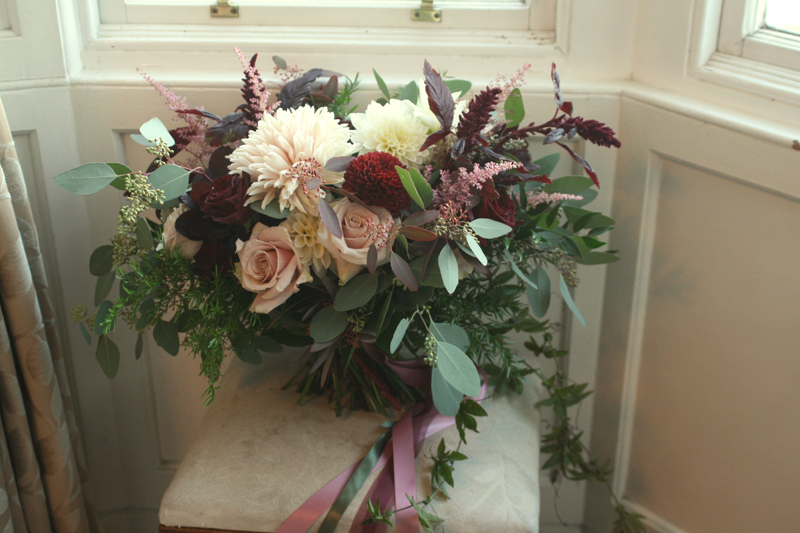 Her bouquet was one of my favourite’s ever. Emma wanted big and wild with lots of texture. Her bouquet included café au lait dahlia, chrysanthemum Avignon, black baccara roses, quicksand roses, amaranthus, astilbe, asparagus fern, eucalyptus, soft ruscus and some gorgeous passion flower vines from my garden. I also supplied a top table arrangement, buttonholes, pew ends and flowers for the wedding cake. Just a message to say thank you so so much for the most beautiful flowers on Saturday. They were even better than i ever imagined, and the top arrangement and cake also looked simply stunning. You made an incredible job of them. I was honestly in awe! Thank you so much- we will most definately be recommending you!